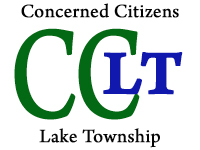 9/2/06 to Michael Cook, EPA Superfund Remediation Director | Concerned Citizens Lake Twp. Region 5’s Richard Karls’s letter dated August 10th to CCLT written on behalf of EPA Administrator Steve Johnson appears to primarily rely upon your letter to our citizens’ group dated April 26th, 2006, to dismiss all our concerns. We are extremely frustrated by your depending upon a 13 years old report written by an ad hoc SAB panel, especially now that a journalist has learned that the majority of that committee has reportedly admitted that they were not even qualified to discuss radiation testing methods and procedures, which should clearly now render this report null and void. Much is at stake, given that IEL was used as the example for all other Superfund Sites in the country suspected of containing radiation, reinforcing the bad policy of using the Finished Drinking Water Method on raw, untreated water. It is believed this method can mask man-made nuclear materials leaking from sites given several inherent loopholes within the method. Those biases are central to the Uniontown IEL case. Also, your reliance upon the EPA Inspector General report in declaring the IEL radiation case “closed” is equally troubling. Many have questioned why the IG chose to blatantly ignore US EPA’s own top radiation research expert’s technical advice that the IEL samples should NOT have been filtered. (The IG admitted to CCLT that it had been informed of this by Mr. Wilhelm in 11/03). Instead, the IG turned away from this crucial technical information, and sought the opinion instead of a person living outside this country. Because our own US government agencies – the DOE, NRC, US GS and yes, your own US EPA Research & Development scientists all appear to be in agreement on key issues related to filtering and sample preservation in contrast with the opinions expressed in the IG report, the question must now be asked: Why does one man’s opinion (who does not reside in the US) cited in the IG report take precedence over the vast amount of accumulated scientific evidence found within our own country in multiple agencies? It was sound science to field filter all the 1992-93 NAREL radiation samples, including private residential wells (2 out of 4 rounds)? US EPA’s R & D concurs that it is sound science to fail to preserve radiation samples immediately upon collection in the field to maintain sample integrity to prevent loss of count? US EPA’s R & D concurs that it is sound science to stop plutonium counting at merely 2 hours, causing the uncertainty to be sky high? Please explain how this is “cost effective” – to produce unreliable results – which has been the main argument. US EPA experts listed above all concur that it is good science to use th EPA Finished Drinking Water Method 900 (meant for clean, treated water systems), for Superfund site investigations on RAW, UNTREATED groundwater? US EPA R & D radiation experts concur that an MDL of 1 pico curie per liter for Plutonium (geared toward Finished Drinking Water) is sound science when conducting a Superfund site investigation to learn whether Plutonium is present and leaking into groundwater, when the same MDL of 1 in turn inherently allows labs to stop counting samples at just 2 hours, which causes the high uncertainty, and this “uncertainty” is then used to claim “no evidence” of plutonium – which can affect a cleanup decision? Or, does EPA’s radiation experts in R & D support longer counting, better sensitivity to achieve what DOE routinely does at 0. 02, to learn if Pu is present at site? EPA’s experts listed above concur that retesting the same plutonium sample should be “reproducible,” following acid leaching, or is this faulty thinking and science? We request this letter be presented to the above listed EPA experts with a written response as to their each individual response to clarify their true positions. Mr. Cook, we sincerely hope you will now conduct a proper investigation into these issues on behalf of Administrator Johnson, that than passing the buck by citing the two questionable aforementioned reports. To verify what NRC & DOE does concerning these matters, we request that you contact Mr. Dave Sill located at the Idaho Engineering Lab – phone: 208-526-8031. We believe you will discover that Mr. Sill will corroborate your own technical expert’s advice, Mr. Ron Wilhelm, on these matters. Given that you head up the nation’s Superfund Program, and your title also states “technical innovation” – we believe it is your duty to be receptive to adopting sound, state of the art science. While perhaps ten years ago EPA was not aware of concerns regarding the particle phase in water, it clearly and overwhelming is now aware of those concerns. Yet, Superfund EPA’s current policies fail to utilize the best science available, clinging to a decades’ old method instead. Mr. Cook, many mistakes have been made at IEL. We ask that you act proactively to change course, not only for Uniontown’s sake, but all other sites across the country where radiation may be leaking and threatening the quality of America’s drinking water – a vital resource. Chris Borello, President, CONCERNED CITIZENS OF LAKE TWP.